Glaucoma is a painful disease that can lead to loss of vision for your pet. 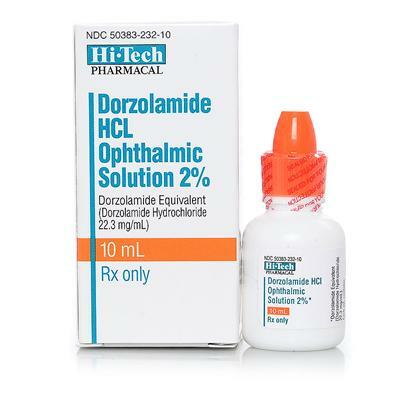 Ask your veterinarian about Dorzolamide Hydrochloride Ophthalmic Solution. It is indicated for use in the treatment of elevated intraocular pressure with ocular hypertension or open-angle glaucoma. Dorzolamide HCL also lowers the risk of nerve damage and loss of vision, something every pet owner wants. If any side effects occur (swelling, hives, difficulty breathing), stop using Dorzolamide HCl on your pet and contact your veterinarian. Do not touch the dropper to any surface, including the eyes and hands. If it becomes contaminated, it could cause an infection in the eye. Hydroxyethyl Cellulose, mannitol, sodium citrate dihydrate, sodium hydroxide (to adjust pH) and water for injection. Follow the directions as prescribed by your veterinarian.